IRIB Islamic Republic of Iran Broadcasting censors the images that go against the Islamic tastes and ideology. A She-Wolf logo brings lust and depravation. The IRIB (Islamic Republic of Iran Broadcasting) logo is not engaging: a spider styling a labyrinthal calligraphy, all in black. The constitution was accepted in 1979 by referendum. It gave a free hand to political Islam in building a self-serving theocracy. 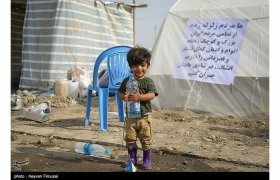 The Iranians who voted in favour of Velayat-e Faqih, were given free rope to hang themselves with … and they did. In today’s Iran, woman are beaten by ‘morality police’ for wearing ‘insufficient’ hijab. Usually New Years are associated with collective enjoyment, happy gatherings and best wishes for everyone. 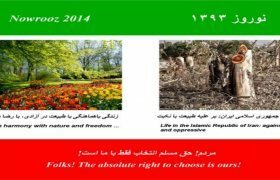 However, for a little while, the New Year of 1397 in the Iranian calendar has been a grotesque parody of the “Islamic Values”. Stories have been reported that bear witness to a deep-rooted levity in Iranian minds that annihilates the seriousness of the consequences of such events. 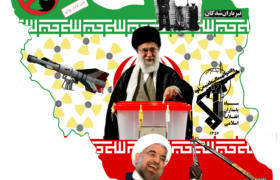 They have also illustrated to what extent most Iranians adhere to the official blather rather than seek positive and efficient ways of suppressing the causes of the nonsense. The far-fetching ideology of the Islamic Republic of Iran gets a weak riposte from the population. IRIB is the Iranian public broadcasting service, equivalent to the BBC or France Télévisions, except that freedom of expression and independent investigation are banned from its programming. It has no competitor within the country and is a formidable machine to enforce the Islamic values. 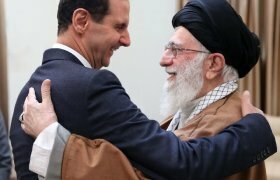 IRIB is supervised by the Leader, a council of representatives from the Judicial power, and various propagandists and censor bureaux. Iranians are football crazy. Therefore, the major matches of the European leagues are broadcast live by IRIB with a limitation; a minimum delay of 10 seconds in transmission is used by the TV producers to delete the images that are deemed inappropriate for the pious Muslims of Iran: men and unveiled women mixing, joyfully hugging each other, or ad banners for beers, are most dangerous for the innocent minds. The childish stupidity of religious censorship escalated to a paroxysm with the live broadcast of the Champions league match between Barcelona and AS Roma, on April 4th 2018. Musei Capitolini, Rome, Italy, was visited by Hassan Rouhani in 2016. 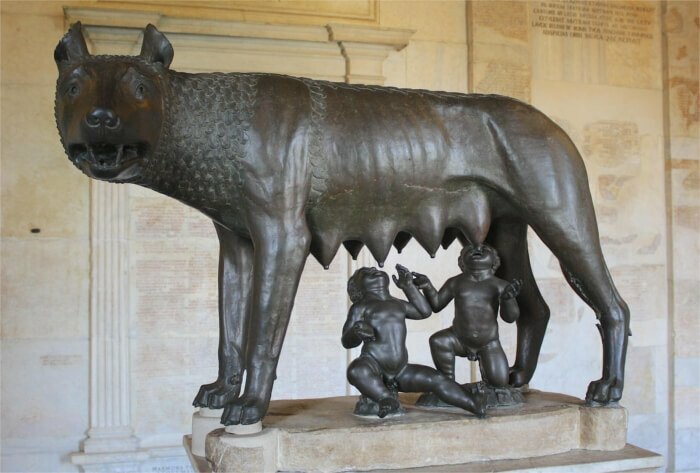 The distinctive image of the she-wolf feeding the twins, Romulus and Remus, her milk is the symbol of Rome. As it happens, it is also the logo of Associazione Sportiva Roma (AS Roma) football club. As IRIB saw it, a rebellion would follow if AS Roma’s logo was to be seen by the Iranians. Therefore the mammary glands of the she-wolf were blurred on Iranian TV screens. Censoring the images that go against the official Islamic tastes and ideology is a decades-long practice of IRIB. It is forty years since the Islamic gender segregation forbade women from being admitted to a football match alongside men. It is forty years that she-Iranians have had to sit in their living rooms with a bowl of nuts to enjoy censored live matches. Their men find the situation amusing or irritating when the best moments of a game are interrupted. But they would not move a finger to change the situation. They have accepted, they will do as they are told and damn the consequences. The clerics who have ruled the country with a rod of iron for four decades can sleep soundly; silliness is not lethal. It has never killed anyone, neither the silly nor the ones who dance to his tune. In a couple of weeks, AS Roma will play Liverpool in the semi-final of the Champions League. IRIB may blur the she-wolf altogether or present her in hijab, or find a he-wolf to represent her. But why? Why did the she-wolf feed Romulus and Remus? Why are Romans so keen to have her as their icon? 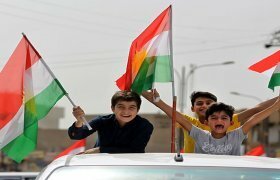 The Iranian fans should consider that healthy curiosity is a blessing. There will some more for IRIB to blur. 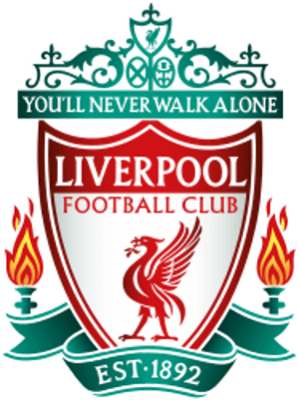 You’ll Never Walk Alone, Liverpool’s motto, in the minds of the Iranian theocracy might ring subversively, and what if the cormorant on their badge was a she-liver bird? 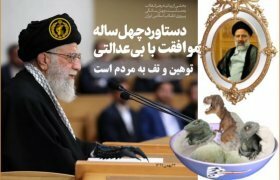 R. Khomeini said (Kashf al-Asrar, p. 283): These lascivious animals who, on the plea of wanting to develop the country, engage in bacchanalian revelry with the young daughters of the people, continue to persist with this heinous policy of unveiling – which casts the modesty and correctness of our susceptible youth to the winds and was one of Riza Khan’s biggest acts of treason against this country – oblivious to the fact that very soon, if God wills, the religious people will raise an iron fist and deliver them a blow such that it will knock these feelings of lust right out of their foolish heads. The Iranian did not really believe him, but has followed Khomeini for forty years. In Iran, only the vultures get to rule the country. We might as well have a male vulture, preferably an old one, as an icon. The mass-communication media, radio and television, must serve the diffusion of Islamic culture in pursuit of the evolutionary course of the Islamic Revolution. To this end, the media should be used as a forum for healthy encounter of different ideas, but they must strictly refrain from diffusion and propagation of destructive and anti-Islamic practices.It is incumbent on all to adhere to the principles of this Constitution, for it regards as its highest aim the freedom and dignity of the human race and provides for the growth and development of the human being. It is also necessary that the Muslim people should participate actively in the construction of Islamic society by selecting competent and believing officials and keeping close and constant watch on their performance. They may then hope for success in building an ideal Islamic society that can be a model for all people of the world and a witness to its perfection (in accordance with the Koranic verse “Thus We made you a median community, that you might be witnesses to men” [2:143]).